Cinchona (Cinchona Spp) other names: Bois aux Fièvres, Cinchona calisaya, Cinchona carabayensis, Cinchona ledgeriana, Cinchona officinalis, Cinchona pubescens, Cinchona succirubra, Chinarinde, Cinchonine, Écorce du Pérou, Écorce de Quina, Écorce de Quinquina Rouge, Fieberrinde, Jesuit's Bark, Kina-Kina, Peruvian Bark, Poudre des Jésuites, Quina, Quinine, Quino, Quinquina, Quinquina Gris, Quinquina Rouge, Red Cinchona Bark. The plant known as the cinchona is a tall evergreen tree that often reaches between fifty to a hundred feet in height when fully mature. The leaves of the cinchona are flat and broad, marked off by large veins running in the lamina which has a shiny green surface. 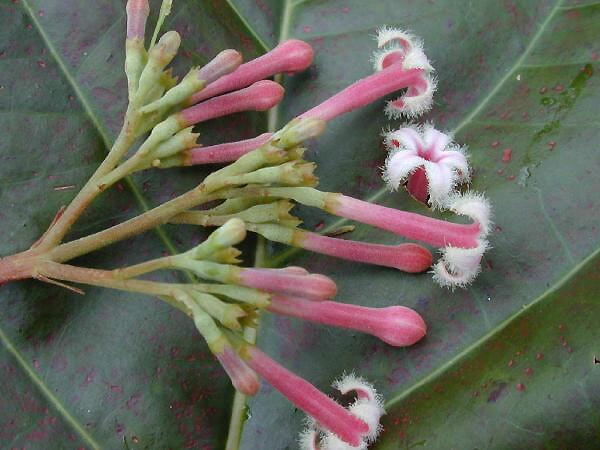 Cinchona flowers are white, pink or red in color and are often elongated; they are also covered all over thickly with silky hairs, giving them a very distinct appearance. Malaria was a major enemy for the American troops who fought their way from one island to island during the Second World War. These troops “island hopped” across many places in the South Pacific, where they faced a formidable non-human enemy in the form of the deadly protozoan parasite that causes malaria. In most of the tropical jungles of these islands, the deadly microscopic foes lay for human victims and caused a lot of needless casualties. Malaria is caused by the protozoans belonging to the genus Plasmodium, which when injected into the human blood by way of the needle fine proboscis of a mosquito, will subsequently bring on the debilitating disease of malaria on the unlucky victim. The compound called quinine found in the bark of the cinchona was the chemical weapon of choice against malaria. Cinchona was at the time cultivated largely on the island of Java in the Indonesian archipelago. At this time, the enemy controlled Java, and as a result very little cinchona was available for the treatment of U.S. troops affected by malaria. Malaria began to be controlled to a great degree only with the eventual development of a synthetic substitute for quinine previously only obtainable from the cinchona tree. The medical battle against both microscopic and human enemies was won once the synthetic quinine was available. Cinchona trees are in fact not an indigenous species to Indonesia. They were introduced to Java by European colonists. These tall and broad leaved evergreen trees are new world plants native to the Americas. Cinchona is a distinctive plant with fragrant clusters of small flowers and was originally found in tropical America. Spanish priests were the first to collect the plants in the early 17th century from the Andean region of South America. They recognized the curative powers of the bitter tasting cinchona bark in treating malaria - the natives traditionally used the cinchona bark to treat malaria. Cinchona trees thrive in rain forests found at elevations between 3,000 and 11,000 feet in South America, there are at least forty documented cinchona species in South American forests. Soon, the medical community in all of Europe became alert to the miraculous power and curative compound found in the bark of about a dozen cinchona species - then known as the fever tree. The name was appropriate as the cinchona bark in powdered form not only cured malaria but also reduced elevated temperatures during fevers of all kinds. Therefore, cinchona bark was one of the earliest miracle cures obtained from the wild. However, the majority of European physicians still refused to use the new medicine on their patients as the remedy were primarily being promoted by the Jesuit priests. An order that was deeply hated and dread across much of protestant Europe at that time. Thus, many countries with protestant kings or queens barred the entry of "Jesuits' bark," or "Jesuit powder," into their land. This led to a bizarre situation where the cinchona bark was all but barred in many countries in which malaria was in the process of exacting a terrible toll on the population. Things began to turn around as the curative power of the bark was undisputed and real, and thus necessity finally prevailed over prejudice, towards the end of the 17th century in many areas of the world, the powdered bark of the cinchona was being used as a primary treatment for malaria affected patients. Cinchona bark powder was never considered to be a pleasant herbal remedy even when mixed in water - it turned the water bitter. The bitter liquid needed to be drunk often and in large dosages by the patients. In the early days, though the optimal dosage was never reached, it was still the only remedy that worked and was unavoidable in case of malarial infections. The demand for cinchona during the 19th century in Europe and across the world increased to such an extent, that viable populations of the trees in South America were almost exhausted and the cinchona was threatened with extinction. European colonists made an attempt to cultivate different cinchona species in their colonies found in tropical regions of the world. In this attempt, the most successful Europeans were the Dutch colonists on the Indonesian island of Java - which turned out to have the best conditions for growth of cinchona trees. In the contemporary world, as a result of the diffusion of the cinchona to many former European colonies, the world's cinchona supply mainly comes from central Africa and Indonesia, in addition to South America - its main place of origin. Cinchona has also managed to reestablish itself in many areas of the South American continent. The cinchona is indigenous to the mountainous tropical regions of the South American continent, particularly the tropical area of Peru - it is also found in other countries in tropical South America. 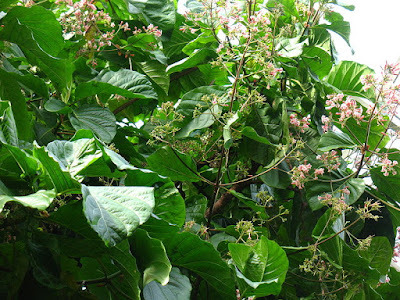 Cultivation of the cinchona is big business, and cinchona plantations can be found in Asian countries such as India and Indonesia - mainly Java. Cinchona is also cultivated in many parts of Africa. In these areas, the cultivation of the cinchona is intensive and carried out on large commercial tree farms. Propagation of the cinchona trees is done from cutting late in the spring season. Harvest of the product consists of the removal of trunk bark and bark from the branches and the root. The bark is normally only removed from six to eight year old trees, and the collected bark is then subjected to drying in the sun on mats. Annually, approximately 8,000 tons of the bark is harvested from such farms. Cinchona is a tree. People use the bark to make medicine. Cinchona is used for increasing appetite; promoting the release of digestive juices; and treating bloating, fullness, and other stomach problems. Cinchona is also used for blood vessel disorders including hemorrhoids, varicose veins, and leg cramps. Some people use cinchona for mild attacks of influenza, swine flu, the common cold, malaria, and fever. Other uses are for cancer, mouth and throat diseases, enlarged spleen, and muscle cramps. Cinchona is used in eye lotions to numb pain, kill germs, and as an astringent. Cinchona extract is also applied to the skin for hemorrhoids, stimulating hair growth, and managing varicose veins. The name cinchona reportedly comes from the name of a Spanish Countess, the Countess of Chinchon, who was treated for a fever using a remedy made from the bark while in South America. Upon recovering, the countess had saplings of the herb sent to Europe, where the plant species were subsequently name after her. The curative powers of cinchona bark was initially revealed to Europeans by Jesuit priests who traveled to Peru in the 17th century, the Jesuits found that the native people chewed on the bark of the cinchona to prevent shaking and chills that came after they worked in icy streams for the early Spanish colonial mines. The native peoples had traditionally used the bark of cinchona for treating fevers and chills as well as malaria. The Jesuits eventually linked the shaking from cold to the shaking of the body commonly seen during a bout of malarial fever in patients. These Jesuits then went a step further and tried chewing on the bark of cinchona as a means to treat malarial fevers. The cure worked, however, the Jesuits were not always trusted, and the medication was suspect to some degree as bark from some varieties of cinchona was not potent enough to cure malaria. When it was initially introduced, chewing the bark of cinchona did not always result in a complete cure from malaria. This was one factor that brought on distrust and persecution of many Jesuits in different European countries. By 1820, the cinchona had been established as being a definite cure for malaria and its use was widespread. Quinine from cinchona extracts became the only medication for malaria. However, the world was dependent on cinchona trees for the supply of quinine and this led to a race for synthesizing quinine from other sources. American chemists succeeded in synthesizing quinine in the year 1944, during WW2 when supplies of natural quinine were mostly out of reach. Following the success of synthetic quinine, different quinine based medications like the chloroquine and primaquine were subsequently used in treating malaria - these synthesized compounds were safer and more potent than the natural extracts of the bark. The effectiveness of cinchona bark and quinine itself in the treatment of malaria has been questioned by recent evidence that show the existence of certain resistant sub-species of the malaria causing pathogens. The discovery of these resistant variants of the parasite has sparked much debate about the real effectiveness of the whole plant over the synthetic variety. Herbal remedies prepared in many places around the world still rely on the use of the natural bark. Cinchona is traditionally considered to be a stimulant for flagging appetite in Brazil, where it is also used to cure physical fatigue and exhaustion. In other South American countries such as Venezuela, the cinchona bark is employed as an herbal remedy for the treatment of cancers in various parts of the body. The bark of cinchona is also the primary source for the alkaloid medication known as quinidine, which is used in the treatment of cardiac arrhythmias and related heart conditions. Cinchona bark remedies have been used in various herbal treatments by the indigenous people of Peru over the centuries. The bark of cinchona remains a traditional and much utilized herbal remedy for treating all kinds of fevers, various digestive problems, and different types of infections or disorders. Malaria was primarily treated using extracts from the cinchona bark, in particular quinine, till about the World War I and the inter war years. Synthetic quinine became available during the Second World War. The synthetic form of the alkaloid was mainly used. However, from the 1960s onwards, the malarial parasite began to develop resistance to the synthetic medication chloroquinine. This situation brought natural quinine out of the shelves again for use in treating malaria. All kinds of fever induced symptoms and feverish conditions in the body can also be treated using quinine. Cinchona bark also stimulates the secretion of the saliva, moreover this bitter tonic induces digestive secretions and boosts the appetite - aiding the recovery of the weak digestive system. An infusion made from the bark of the cinchona is effectively used as a gargle for treating sore, infected throats and other oral problems. Herbal remedies made from the cinchona plant are used in the treatment of muscular cramps, particularly the muscular cramps that come in the night. Remedies made from the cinchona are also helpful in bringing relief from chronic arthritis and related problems. Cinchona is used in the Indian ayurvedic system of medicine for the treatment of problems such as sciatica and dysentery, in addition to problems connected with kapha and other disorders. Cinchona bark seems to be safe for most people when used appropriately. However, in large amounts, cinchona is unsafe and can be deadly. Symptoms of overdose include ringing of the ears, headache, nausea, diarrhea, and vision disturbances. Cinchona can also cause bleeding and allergic reactions, including hives and fever. Pregnancy and breast-feeding: Don’t use cinchona if you are pregnant or breast-feeding. There is some evidence that cinchona is unsafe to use during pregnancy. Not much is known about the safety of using cinchona if you are breast-feeding, so it’s best to avoid it. Stomach or intestinal ulcers: Don’t use cinchona if you have ulcers. Cinchona might increase the risk of bleeding. Surgery: Cinchona can slow blood clotting, so there is a concern that it might increase the risk of extra bleeding during and after surgery. Stop using cinchona at least 2 weeks before a scheduled surgery.